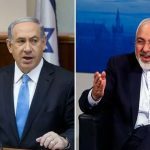 Iran’s Foreign Minister Mohammed Javad Zarif accused Israeli Prime Minister Benjamin Netanyahu of “fake history” for saying that Iran sought the annihilation of the Jews, just as had ancient Persia. 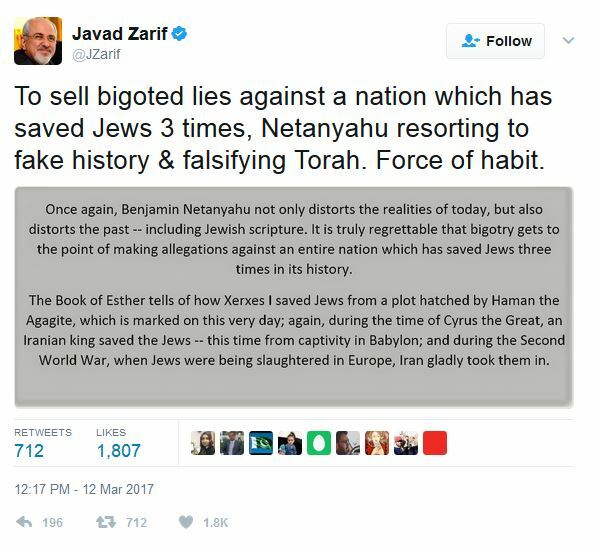 “To sell bigoted lies against a nation which has saved Jews 3 times, Netanyahu resorting to fake history & falsifying Torah. Force of habit,” Zarif tweeted. 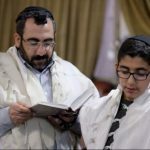 On Saturday, Netanyahu visited a synagogue, where he told children celebrating the holiday that Iran seeks to kill the Jews just as the Persians did. Purim started Saturday night, with costumes and street parties around Israel. 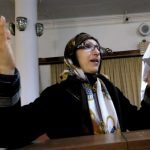 In a text attached to his tweet, Zarif wrote: “Once again, Benjamin Netanyahu not only distorts the realities of today, but also distorts the past — including Jewish scripture. 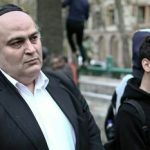 It is truly regrettable that bigotry gets to the point of making allegations against an entire nation which has saved the Jews three times in its history. “The Book of Esther tells of how Xerxes I saved Jews from a plot hatched by Haman the Agagite, which is marked on this very day,” he wrote, referring to the king known in the Purim story as Ahasuerus. Jews see Queen Esther as the heroine of Purim for talking Persian King Ahasuerus out of killing all the Jews in the kingdom, as his viceroy Haman initially convinced him to do. 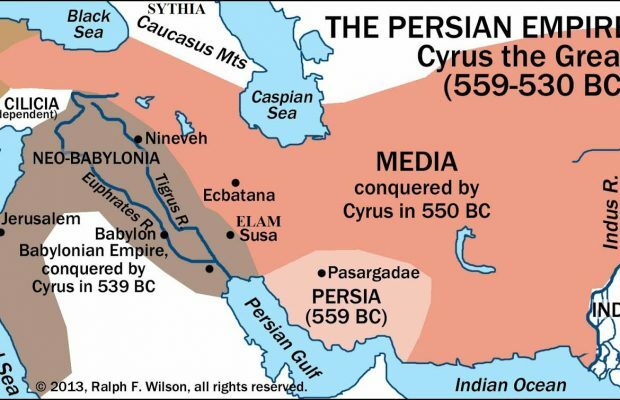 Zarif in the text also credited Cyrus the Great, who he called an “Iranian king,” with saving the Jews during their exile in Babylon and Iran with “gladly” accepting Jews who “were being slaughtered in Europe” during World War II. 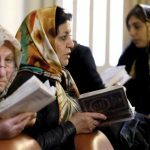 In a meeting with Russian President Vladimir Putin in Moscow Friday, Netanyahu said Iran sought to “destroy the state of the Jews” just as ancient Persia had plotted to “destroy the Jewish people.” But Putin rejected the parallel, saying the story of Purim occurred “in the fifth century BCE” and suggesting they discuss the “different world” of today.